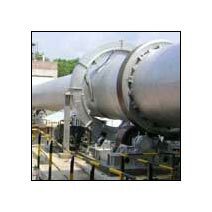 Rotary Calciners are used for calcining of the material at high temperature. The Rotary Calciner comprises of rotating shell supported on rollers / tyres and driven by means of suitable drive arrangement. The internals are suitably refractory lined to minimize the heat losses. The combustion chamber is used for producing hot gases required for the calcination and it is connected to the Rotary Calciner through a stationary hood. The feed material is fed into the calciner feed hood through Screw Conveyor at controlled rate. The materials to be calcined travel in counter current fashion within the Calciner and gets discharge through discharge hood. Direct Fired / Indirect Fired Air Heaters: using Liquid / Gaseous Fuels. Direct / Indirect Fired Air Heaters: using Solid Fuels, Agro Waste, Saw Dust, Rice Husk, Coal, Briquette etc. Cyclone Separators – Mono, Twin, Quadruple etc. Rotary Cooler for cooling of calcined product. Pneumatic conveying systems for feed material and finish product handling. Computerized control system through PLC / DCS & SCADA.